Lewisburg/White Sulphur Springs, West Virginia U.S.A.
used on the two turntables along the rear wall. Commercial eight-track tapes (not the similar "carts"
seated, in this photograph, at the extreme left. This Internet web site briefly documents the history of a small, but fairly unique educational radio station, which operated in southeastern West Virginia U.S.A. during the Summer months in the 1960s and 1970s. 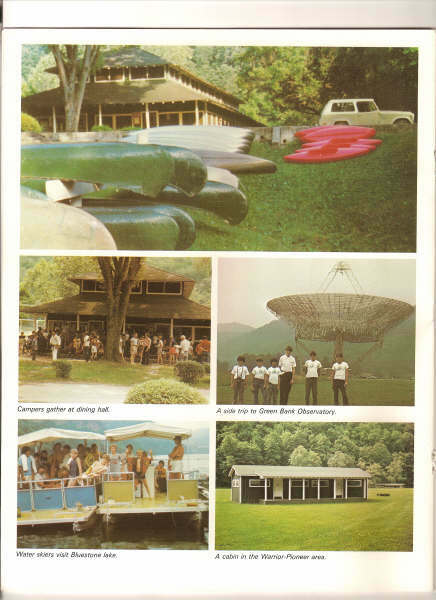 WLCR-AM Carrier Current was a radio station operated at a Summer camp for boys and girls called Camp Shaw-Mi-Del-Eca located between Lewisburg and White Sulphur Springs, West Virginia. Actually, by 1967, the radio station was operated using the call letters, WCDW, while the call-sign, WNEY, was used from 1968 through 1970. In 1971, WLCR-AM Carrier Current was the station identification used to signify a special form of low-power broadcasting: by carrier-current over the electrical wiring of the Camp. 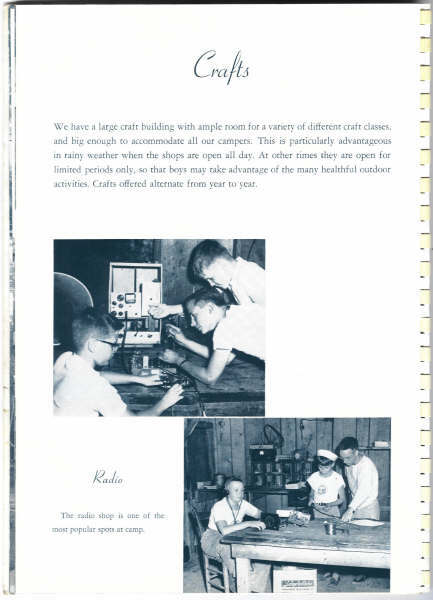 Radio instruction at Camp Shaw-Mi-Del-Eca dates back to, at least, the 1950s, when Mr. Bennett taught campers how to build crystal radio receiving sets. Frank Adams, a camper in the 1950s, also remembers Mr. Bennett helping the campers to string an antenna in the trees and provided an insulator to keep from grounding the free end. Apparently, no active radio station operated in the 1950s. The author was employed with Shaw-Mi-Del-Eca, Incorporated (which operated Camp Shaw-Mi-Del-Eca from 1972-1977), as a Camp Counselor and as General Manager of the Camp's radio station, WLCR-AM Carrier Current, during the Summers of 1972 through 1977. The author was also a camper at Camp Shaw-Mi-Del- Eca, as well as a staff member of the Camp radio station, during the Summers of 1967 through 1971. During the years 1968 through 1971, the author served as the radio station's News Director; the author broadcast live newscasts several times each day. The Camp radio station and The Radio Group--the name given to the campers involved with the radio station--started in the 1960s. By the Summer of 1964, radio broadcasts originating at Camp Shaw-Mi-Del-Eca were transmitted throughout the Camp. Apparently, these broadcasts were strong enough to be heard in Lewisburg (3 miles away) and White Sulphur Springs (6 miles away). However, for such a range, this was much too powerful for an unlicensed radio station, as the Camp radio station never acquired an official government license from the Federal Communications Commission (FCC). By the Summer of 1966, the radio station was temporarily off the air, until the transmission power was lowered to meet Federal Communications Commission regulations. The Camp radio station returned to the air in the Summer of 1967. 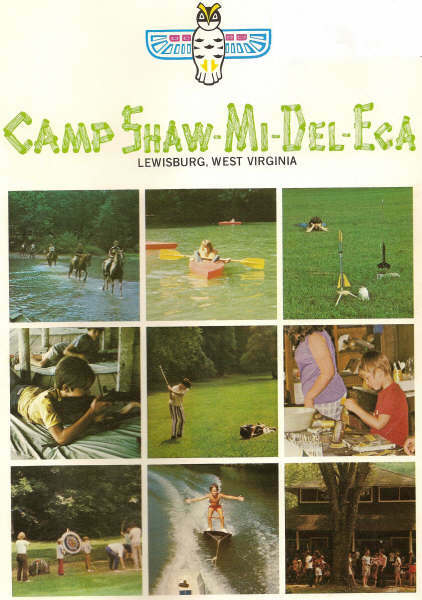 When the author became the Radio Counselor in charge of the Camp radio station in the Summer of 1972, the radio station sign-on and sign-off announcements included a postal address where listeners could write if they heard the broadcast beyond the confines of Camp Shaw-Mi-Del-Eca. 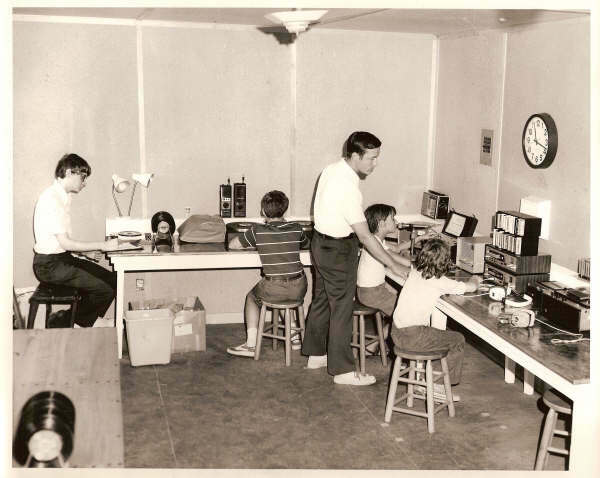 From 1972 through 1977 (the years Mr. Walsh was Radio Counselor), the radio station received no reception reports from outside of Camp Shaw-Mi-Del-Eca. Radio station WCDW(CDW was an abbreviation for the village immediately outside of the Camp entrance, Caldwell, West Virginia) was operating as the Camp radio station, from an open-air(insect screens were the only thing which separated the radio station from the noise of the rest of the Camp!) studio in the front portion of the second floor of the Woodcraft Building(which only had two floors). The broadcasting of WCDW had been initiated by General Manager and Camp Counselor Kent C. Hoffman from Baltimore. WCDW broadcast all day long, but did sign-off late in the evening, when all of the campers had gone to bed. Tape recordings were broadcast during the Camp Shaw-Mi-Del-Eca scheduled meal times(breakfast, lunch, and dinner), when all of the campers and counselors were eating in the Dining Hall. WCDW broadcast national news and features from the NBC Radio Network; this included the popular weekend network program "Monitor." WCDW broadcast on the AM radio frequency of 830 KiloHertz(i.e. kilocycles per second). In order to comply with Federal Communications Commission(FCC) rules and regulations regarding low power broadcasting, WCDW broadcast with no more than 100 milliwatts (one-tenth of a watt). A small repeater transmitter (broadcast on 1250 KiloHertz], with even less power, was located at the other end of the Camp, on an upper shelf in a closet of one of the cabins used by the Warriors(the youngest group of campers), to augment reception in that part of the Camp. During the years 1968 through 1970, Mr. Hoffman served in the United States Navy and could not work at Camp Shaw-Mi-Del-Eca during those Summers. Thomas McEldowney served as radio station General Manager during those Summers. Mr. McEldowney changed the station's call-sign to WNEY(the last four letters of his surname), and the station broadcast on 1250 KiloHertz. After his Naval service, Mr. Hoffman returned as radio station General Manager in the Summer of 1971. The call-sign was again changed to WLCR(LCR was abbreviation for Lewisburg-Camp-Radio), and the station became an AM Carrier Current radio station operating on 640 KiloHertz. WLCR-AM Carrier Current broadcast news and features from the CBS Radio Network. In this new operation, the radio station did not broadcast during Camp scheduled meals; the radio station signed-off the air before the meal and resumed broadcasting after the meal. In a Carrier Current broadcast, another form of low power broadcasting, radio signals are sent through the electrical transmission lines of a building or series of buildings on a campus. Any radio receiver within three hundred feet(in theory) of an electrical line, in or outside of a building, should be able to receive the radio station. However, a radio transmission can not pass beyond an electrical transformer. Many college campuses use Carrier Current radio stations to provide students with hands-on radio experience, without the need to obtain an official radio license. For many years, the University of Pittsburgh broadcast an AM Carrier Current radio station, they called WPGH, prior to receiving a Federal Communications Commission license for an educational FM radio station, WPTS. WPTS-FM claims to be the last low-wattage station(today, it transmits 17 watts of power) licensed by the Federal Communications Commission(FCC); it began broadcasting on 1984 August 26. Interestingly, it broadcasts on 92.1 MegaHertz, just outside of the 88 to 92 MegaHertz segment(FCC FM educational allocations run from 88.1 to 91.9 MegaHertz) of the FM Band(88-108 MegaHertz) specifically designated for educational, non-commercial FM radio stations by the FCC. It seems that this radio band segment, in the Pittsburgh market, was already filled to capacity: WQED-FM(operated along with WQED-TV 13), WDUQ-FM(Duquesne University--National Public Radio affiliate), WRCT-FM(Carnegie-Mellon University), and WYEP-FM(independent). At the time the University of Pittsburgh decided to apply for an FM educational radio station license, WYEP-FM had operated for several years as the unofficial campus station. Although it had no official connection to the University of Pittsburgh, the University did allow WYEP-FM to place its radio transmitter at the top of the University's 42-story Cathedral of Learning office and classroom building(tallest academic building in the Western Hemisphere), to maximize transmission coverage. At that time, WYEP-FM had studios in the South Oakland section of Pittsburgh(today, the studios of WYEP-FM are located on Pittsburgh's South Side), only a few blocks from the University of Pittsburgh campus. 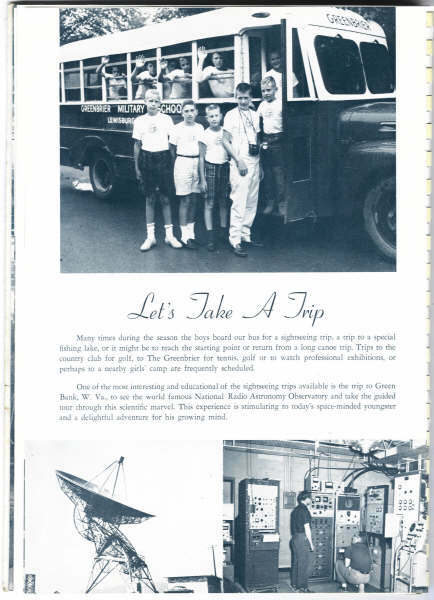 Consequently, many Pitt students volunteered their time operating WYEP-FM, as well as WPGH(AM Carrier Current). When the University of Pittsburgh did decide to apply for an FM educational radio station license, University officials knew that there was no room for the station in the FCC's FM educational band. Carnegie Mellon University did consider shutting-down WRCT-FM, their small FM educational radio station, to allow the University of Pittsburgh to use their FM educational radio frequency. However, in the end, WRCT-FM remained on the air, and WPTS-FM obtained an FM educational radio transmitting license just outside of the FCC FM educational radio band(which is not unheard of--actually, a few AM educational radio stations also exist, but with no specific educational segment of the AM radio band). All of the variations of the AM radio station of Camp Shaw-Mi-Del-Eca broadcast in a low- power mode, in compliance with the Federal Communications Commission's(FCC) Rules and Regulations Part 15. 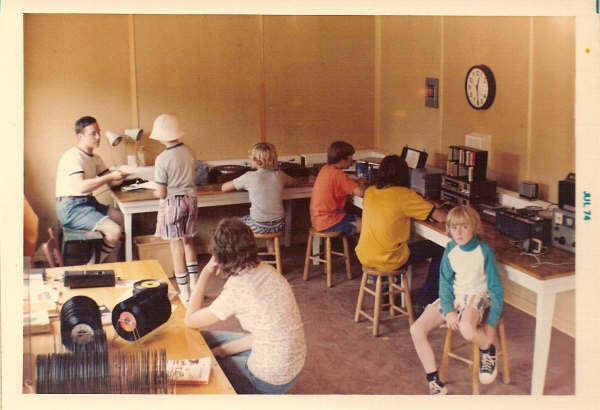 During the 1970s, Mr. Hoffman conducted some brief experiments into FM Stereo broadcasting, via Carrier Current, of the WLCR programming; however, these broadcasts were not continued since few campers had FM radios, during this era. The Camp radio station never required a radio station license from the FCC, due to the low power and Carrier Current operations. Click here to learn more about low power broadcasting. In the Summer of 1972, the author, became the General Manager of WLCR-AM Carrier Current. 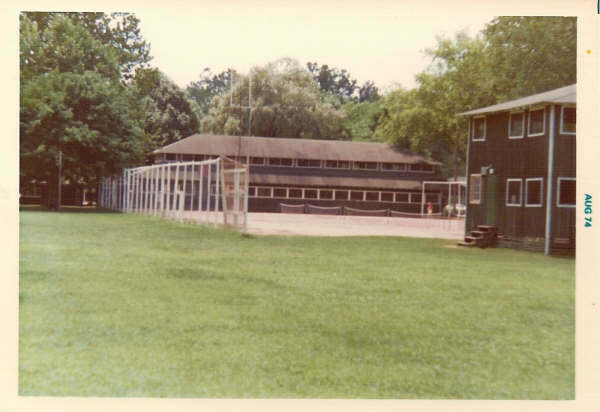 Mr. Hoffman, then employed as a traveling inspector with the National Bureau of Standards(NBS) in Gaithersburg, Maryland, could no longer spend seven weeks each Summer at Camp Shaw-Mi-Del-Eca. However, for the next several years, Mr. Hoffman did spend his vacation as a Camp Counselor and co-General Manager with Mr. Walsh, usually during three to four weeks of the Camp session. Mr. Walsh remained General Manager of WLCR-AM Carrier Current through the 1977 Summer season. Hugh Bean, who as a camper had been very active with The Radio Group, obtained his Third Class Commercial Radiotelepone License with Broadcast Endorsement from the Federal Communications Commission during The Radio Group's trip to Washington in August of 1975. The following year, Mr. Bean, from Martinsburg, West Virginia, became a Camp Counselor and Assistant General Manager of WLCR-AM Carrier Current. which bordered the tennis courts. In 1973, the new owner of Camp Shaw-Mi-Del-Eca, Dr. Eugene McClung, provided a brand new studio for WLCR-AM Carrier Current in the rear of the first floor of the Woodcraft Building(which was then often referred to as the Crafts Building). The new studio was sound-proof and air conditioned--the only air conditioned facility in the entire Camp! WLCR-AM Carrier Current stayed in this location for the remainder of the existence of Camp Shaw-Mi-Del-Eca. Later-on in the author's tenure as radio station General Manager, the Camp constructed a small bedroom for the General Manager in the room adjacent to the new radio studio. This was primarily due to the lack of space in the Camp's cabins. This small, new bedroom was NOT air conditioned! The equipment of the radio station consisted of an RC-6A radio transmitter manufactured by Low Power Broadcast Company (now known as LPB Communications, Inc.), a sound mixer/control board with sliding pots, two turntables, reel-to-reel tape recorder, cassette tape recorder, two eight-track tape decks, Hallicrafters(World War II vintage) multiband radio receiver, and Hammerlund multiband radio receiver. To prevent dust and humidity from hurting the equipment, a blanket or large sheet of plastic was placed over all of the equipment, each night after sign-off--even after the new studio was installed. A home-made electronic security system was installed for the new studio; however, after some false alarms, it was no longer used. In the mid-1970s, the author obtained surplus government weather equipment, and a weather station shelter, which was installed just outside of the radio studio, on the end of the fence of the tennis courts. The radio station became an official Weather Substation of the National Weather Service(administratively supervised by the National Weather Service Forecast Office in Pittsburgh). Prior to installation of the Weather Substation, two thermometers provided the temperature for broadcast; one thermometer was in the east studio window, while the other was in one of the south studio windows. The radio station on-air staff would use the temperature of whichever thermometer was in the shade, at that time. Usually the sky conditions and the current time[the radio station's clock was corrected each day with time transmitted by the National Bureau of Standards' (now known as the National Institute of Standards and Technology) short-wave radio station, WWV] were also broadcast with the temperature; these time--temperature--sky condition reports were announced frequently on WLCR-AM Carrier Current. The campers were taught all the aspects necessary for operation of a radio program. Campers interested in the more technical details were provided instruction that could result in their qualification for a Federal Communications Commission(FCC) radio license, particularly the Third Class Commercial Radiotelephone License with Broadcast Endorsement. Campers were taught how to fill-out radio station Program, Engineering, and Maintenace Logs, as required by the FCC. They were also instructed the proper way to handle equipment and recording materials--particularly the vinyl 33 revolutions per minute(rpm) and 45 rpm(and occasional 78 rpm) records prevelant in that day(NEVER touch the actual record surface, as this could result in more dirt and dust getting into the record's recorded grooves). Overmodulation, when the audio from radio reception begins to get garbled, is forbidden for radio broadcasting by the FCC. The campers were taught to watch the Volume Unit(VU) Meters closely, to ensure there is no overmodulation and high quality audio is transmitted on WLCR-AM Carrier Current. The students were also taught to maintain the efficiency of the broadcast by minimizing "dead-air": time when no sound goes over the radio station's carrier wave signal. And, the campers were taught to follow the rules and regulations of the FCC, regarding station identification announcements as well as sign-on and sign-off announcements. Often, the radio station General Manager supervised campers as they qualified for merit badges for either the Boy Scouts or the Girl Scouts, in Science-related fields. Mr. Hoffman and the author taught a course for campers interested in obtaining a FCC Third Class Commercial Radiotelephone License with Broadcast Endorsement. By acquiring this radio license, campers could operate in any commercial radio station, on the AM or FM radio bands, in the nation; this particular radio license was not valid for operating amateur("ham") radio stations. Over the years, several campers successfully passed the FCC examination and received their Third Class "ticket," after completing the Camp's radio course. These included Glenn A. Walsh (in Pittsburgh in March of 1972), Bill Pugh (in Cincinnati in the Spring of 1975), and five campers who took the FCC test at the FCC office in Washington, D.C. shortly after the Camp season ended in August of 1975: Hugh Bean, Ted W. Bernstein Martin E. Frank, David Froehlich, and Albert (Beau) Holiday. The campers loved to broadcast their programs, primarily Rock-and-Roll musical programs. Considering that most rural West Virginia radio stations played Country music, most campers listened to the Camp radio station. A request program was initiated on Saturday evenings, which had a good response from the campers. However, the station's official format was not Top-40; WLCR-AM Carrier Current broadcast a Top-100 format(from Billboard magazine's list of the top 100 songs of the week). Typically, the on-air staff consisted of an announcer, who would also be in charge of the sound mixer/control board, and an engineer, who would prepare the recordings for broadcast. Sometimes there were three and four on-air staff at one time; some of the better-trained operators could handle the entire broadcast alone. Being an educational, non-commercial station, WLCR-AM Carrier Current broadcast no commercial advertisements. However, the station did broadcast Public Service Announcements(PSAs) both live and recorded(mostly professional recordings sent to the station for no charge). Often, when a camper was broadcasting, he or she would have to visit the rest room; he would need for someone else to attend to his duties while he was gone. In order to prevent the words "rest room," "toilet," or "bathroom" from inadvertantly being broadcast on the air, staff members were instructed to announce a "Code Green" if they needed to use the rest room; then everyone would know what needed to be covered during the person's absence. Twice each Summer(once during each three- and one-half-week session) WLCR-AM Carrier Current played a rebroadcast of the famous 1938 radio broadcast of The War of the Worlds. This hour-long program, first broadcast by Orson Welles on his CBS Radio Network program, "The Mercury Theater of the Air," describes a fictitious invasion of the Earth by beings from the Planet Mars. The format Mr. Welles used, to adapt the classic H.G. Wells science fiction novel to radio, included fictitious radio news bulletins--sounding similar to the radio news bulletins people were used to hearing for actual news events. Of course in this time period, pressures were building towards war in Europe(only twenty years after the First World War). "The Mercury Theater of the Air" broadcast at 8:00 p.m. on Sunday, October 30--the night before Halloween! And, considering that alot of people missed the very beginning of the program, which included a disclaimer clearly stating that the program was a fictional account, many people throughout the country became convinced that Martians really were invading the tiny hamlet of Grover's Mill, New Jerey and making their way to New York City! Swan, Lisa. "'War of the Worlds' terrified the nation 70 years ago." Daily News, New York 2008 Oct. 30. Dixon, George. "Fake War on Radio Spreads Panic Over U.S."
Daily News, New York 1938 Oct. 31. Of course, most campers had heard about this inadvertant historical broadcast, but had never actually heard the broadcast itself. They enjoyed hearing the program, broadcast during the daily "Quiet Hour," a time just after Lunch when campers were expected to stay in their bunks to rest, or play quiet games with their cabin mates. During the 1976 July landing of the Viking space probes on the surface of the Planet Mars, WLCR-AM Carrier Current carried news reports of this event directly from the National Aeronautics and Space Administration(NASA). Ironically, a couple of these reports were aired during the intermission of the broadcast of The War of the Worlds. WLCR-AM Carrier Current also broadcast the weekly, five-minute radio feature program produced by NASA, which was narrated by the then-future weather broadcaster of the NBC-TV "Today Show," Willard Scott. In addition to network news, and features from network or transcribed sources, the Camp radio station did broadcast local Camp news daily. From time-to-time, the campers also broadcast their own commentaries, often regarding Camp controversies. Religious programs, from transcribed recordings mailed to the radio station, were also broadcast weekly. 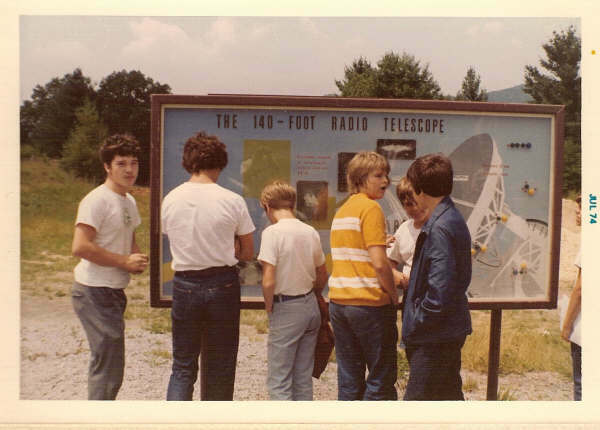 The Radio Group conducted a radio experiment during the total solar eclipse of 1972 July 10, which was viewed as a partial solar eclipse in West Virginia. This eclipse experiment had nothing to do with the radio station. Two multiband radios used in the radio studio for on-air monitors, the World War II-vintage Hallicrafters receiver and the Hammerlund radio, were used to monitor the radio reception of distant radio signals. The question was whether the solar eclipse would affect the Earth's ionosphere to improve distant radio reception, as happens at night when there is a lack of solar radiation hitting the ionosphere. The results were positive; there did seem to be an increase in the receptivity of distant radio signals (as displayed by the signal strength meter on the Hammerlund receiver, in addition to audio quality). With the assistance of the Amateur Transmitters' Association of Western Pennsylvania (amateur radio club), this experiment was repeated during the total solar eclipse of 1991 July 11, which was viewed as a partial solar eclipse at The Buhl Planetarium and Institute of Popular Science in Pittsburgh ( news article from the 1991 July 11 issue of the Pittsburgh Tribune-Review). This time, the results were inconclusive. This probably was due to the fact that, during the 1991 solar eclipse, not as much of the Sun was obscured (as viewed from Pittsburgh) as was covered by the Moon (as viewed in West Virginia) in 1972. In 1972, the total solar eclipse had been viewed in Nova Scotia, while the total solar eclipse in 1991 was viewed in Mexico City; Mexico City is much further away from Pittsburgh, than Nova Scotia is from West Virginia. One interesting anecdote: About a month prior to the 1972 solar eclipse, popular Rock-and-Roll singer Carly Simon mentioned this particular solar eclipse (which would be a total solar eclipse in Nova Scotia) in the lyrics of her popular song, You're So Vain: "Then you flew your Lear jet up to Nova Scotia to see the total eclipse of the sun". Of course, since WLCR-AM Carrier Current played all of the current hit single records (at that time, usually on 45 rpm vinyl records), the radio station often played this Carly Simon song during the Summer of 1972.
and the Voice of America in Washington, D.C.
Members of The Radio Group took several field trips to tour places such as the National Radio Astronomy Observatory in Green Bank, West Virginia and WSLW-AM Radio in White Sulphur Springs, West Virginia. 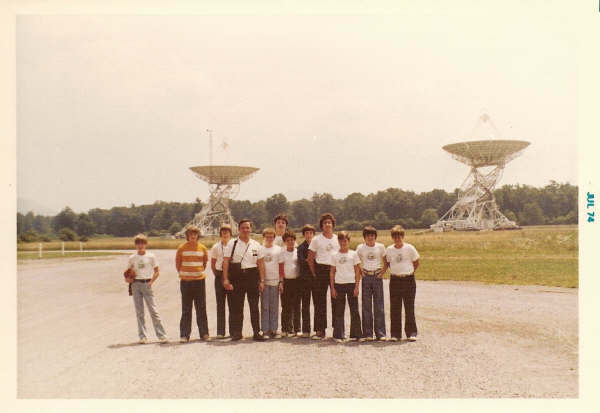 In August of 1975, shortly after the Camp season ended, Mr. Hoffman and Mr. Walsh took the five campers mentioned earlier, who had been studying to take the FCC radio exam, to the FCC office in Washington, D.C. for the examination; all five campers passed the test and earned the radio license. During the visit to Washington, these campers also toured the studios of the Voice of America (VOA), the official short-wave radio station of the United States, which presents news and information about American life to people living in other countries. Other than the Camp radio station, there were few other radio stations available for the campers to listen to. This is particularly true considering that most of the young people of that time wanted to listen to Rock-and-Roll music, while most rural West Virginia radio stations concentrated on Country music. Country music was also the dominant radio station format of the few radio stations that could be received from larger towns such as Beckley, West Virginia and Roanoke, Virginia. The campers were able to present their own programs on the Camp radio statioin, with their preferred choice of music; hence, most campers did listen to the WLCR-AM Carrier Current. Of course after sunset, the campers could listen to radio stations from many of the cities in the eastern and mid-western sections of the United States. Until the 1970s, Greenbrier County only had one other radio station: WRON(AM 1400--Mutual Radio affiliate) in Ronceverte (studio was located in Fairlea, the home of the West Virginia State Fair). In 1971, WSLW(AM 1310--ABC Radio affiliate) started broadcasting from White Sulphur Springs(with a satellite studio in Lewisburg). Unlike today, no FM radio stations or television stations were permitted in this part of West Virginia; today, there is at least one FM radio station in Greenbrier County. Such limited radio transmissions (and no television transmissions) were due to the National Radio Quiet Zone (NRQZ). Established by the Federal Communications Commission (FCC) on 1958 November 19, the National Radio Quiet Zone was established to take advantage of a natural phenomenon, due to the unique topography of Allegheny Mountains in West Virginia and Virginia, which screens-out most incoming radio signals. This natural phenomenon, along with new Federal regulations of the NRQZ, provided for important radio research of the National Radio Astronomical Observatory in Green Bank, West Virginia and the Navy Information Operations Command in Sugar Grove, West Virginia. The NRQZ is approximately 13,000 square miles in size and includes much of the eastern portion of State of West Virginia and some of the western portion of the Commonwealth of Virginia. Camp Shaw-Mi-Del-Eca, the location of WLCR-AM Carrier Current, was located just inside of and near the southwest corner of the NRQZ. As a carrier-current radio station, the radio signal did not appreciably leave the Camp property; so, WLCR-AM Carrier Current never interfered with the Green Bank or Sugar Grove facilities. By coincidence, November 19 is also the anniversary of another facility benefiting astronomical education and research. On that date in 1941, well-known Astronomer Harlow Shapley, then Director of the Harvard College Observatory, gave the keynote address at the dedication of 10-inch Siderostat-type Refractor Telescope of "The People's Observatory," at Pittsburgh's original Buhl Planetarium and Institute of Popular Science. Although not a formal activity, The Radio Group also ran a program in Model Rocketry at Camp Shaw-Mi-Del-Eca, for campers interested in this hobby. Andy Best, one of the campers who was very active with the broadcasting of WLCR-AM Carrier Current, coordinated several model rocket launches for a camp-wide audience. 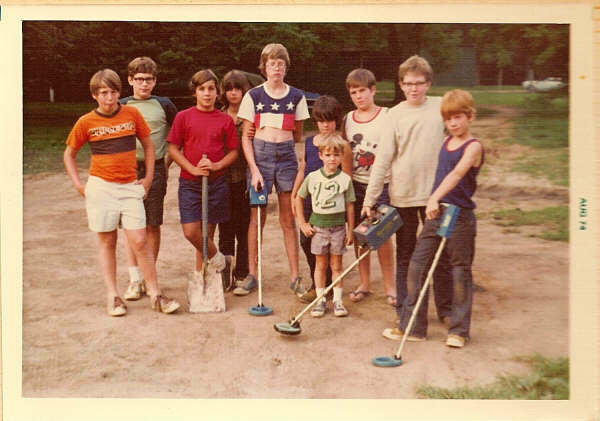 Campers Seeking Buried Treasure With Metal Detectors ! to search for buried treasure, using portable metal detectors. Another informal activity of The Radio Group was searching for buried objects using portable metal detectors. And, one year a small shed next to the Woodcraft Building was converted into an amateur photo lab, to allow campers to develop their own photographs. A few alumni of The Radio Group continued their interest in Radio and Science. WLCR-AM Carrier Current Founder Kent C. Hoffman now runs an electronics firm in suburban Baltimore(Hunt Valley), Murray Electronics, which designs, develops and manufactures medical devices for the treatment of arthritis and related musculoskeletal diseases, including the innovative product, the Bionicare Stimulator System (invented by Mr. Hoffman, who is an electrical engineer and physicist). Since 1989, Mr. Hoffman has been the Secretary-Treasurer of The Society for Physical Regulation in Biology and Medicine; he served as the Local Arrangements Chair in 1988. A camper in The Radio Group, Jim Wiltman, continued his interest in broadcasting, although not as a career. During the 1980s, Mr. Wiltman was employed as a stock broker for the brokerage firm, Parker-Hunter, in Downtown Pittsburgh. One of his daily duties was to broadcast hourly(at twenty minutes after the hour, while the stock exhanges were operating) stock market quotes and information on Pittsburgh's all-news radio station, KQV-AM 1410. The author served as Astronomical Observatory Coordinator and Planetarium Lecturer at The Buhl Planetarium and Institute of Popular Science in Pittsburgh, during the 1980s and early 1990s. The Pow-Wow Camp Newsletter, July 1972. Includes long paragraph (seventh of eight paragraphs) regarding Camp radio station. and which met for many years at Pittsburgh's original Buhl Planetarium and Institute of Popular Science. with studios in the Lower Level of Pittsburgh's historic Buhl Planetarium building. World's oldest and largest club of medium wave (AM Band) distance radio listeners; formed in 1933. Unless otherwise indicated, all pages in this web site are Copyright 2001-2008, Glenn A. Walsh, All Rights Reserved. This Internet web page was originally created 2001 August 12. Last modified : Wednesday, 19-Nov-2008 13:45:02 EST. You are visitor number , to this web page, since 2001 August 12.